American Eagle one-once silver and gold coins are the final remaining 2008-dated bullion products from its depleted inventory, the U.S. Mint told its authorized dealers in a memo on Monday. All sizes of American Eagle platinum and American Buffalo bullion coins, plus the American Eagle gold fractional sizes are gone. Additionally, the Mint said there would be one final allocation of the eagle coins, and the launch of other 2009-dated bullion coins would be delayed due to high demand and the inability to acquire sufficient blanks, which are the metal discs onto which coins are struck. For dealers who buy and then sale these coins intended for investors, the only good news was that 2009-dated American Eagle Gold One-Ounce and American Eagle Silver One-Ounce Bullion Coins would be available in an allocated basis by year’s end. With the exception of the American Eagle Gold One-Ounce and American Eagle Silver One-Ounce Bullion Coins, all 2008-dated bullion coins have been depleted. Weekly allocations will continue for these two products. The final 2008 allocation for these coins will be provided on Monday, December 15, 2008. There will be no bullion allocations during the week of December 22, 2008. 2009-dated American Eagle Gold One-Ounce and American Eagle Silver One-Ounce Bullion Coins will be made available for sale via the standard allocation process on Monday, December 29, for pricing December 30 and order pick-up on Friday, January 2, 2009. Allocations for these products will continue until the United States Mint is able to meet demand. The quantities of blanks that we have been able to acquire from our suppliers continue to be very limited, while demand for bullion coins remains high. 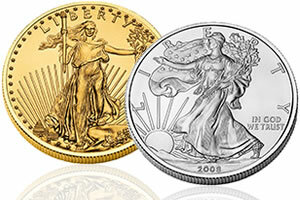 As a result, it is necessary for the United States Mint to delay the launch of other bullion coins until later in 2009. We will continue to monitor the situation and keep you informed as additional information becomes available. Thank you for your patience and your continued support of the United States Mint Bullion Coin Program. The above mentioned coins should not be confused with the American Eagle or American Buffalo collector proof and uncirculated versions sold directly on the Mint’s website. However, these coins are also quickly becoming exhausted, as is evident from the chart of gold and platinum coins listed at U.S. Mint Collector Bullion Coin Prices, Premiums and Sales Figures.